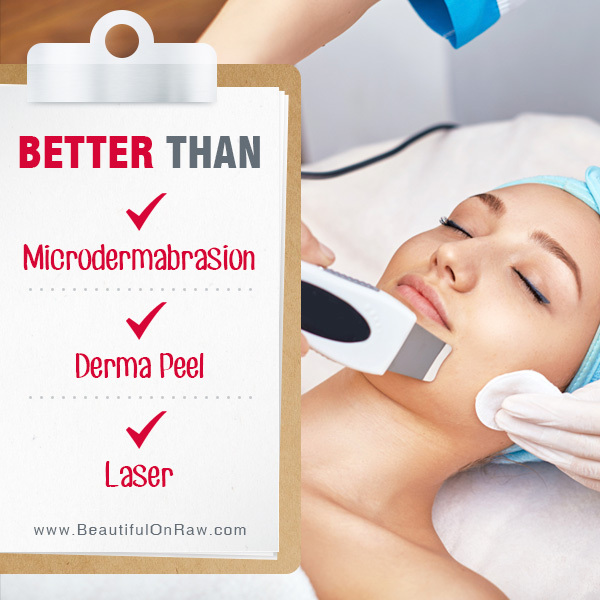 New, expensive skin rejuvenation methods and tools appear every day—microdermabrasion, carbon-dioxide laser resurfacing, the diamond microdermabrasion machine and so on. They all have this in common: They strip your skin’s outer layer and induce your body’s repair response. It’s just like when you get a small cut—your body produces everything needed to heal your skin. One of the vivid memories of my younger years is my Mom’s swollen face as she was recovering after a phenol or TCA peel. Once the face healed she did look better, but only for a little while. Then…off she’d go for another peel. Even as a youngster I knew something wasn’t right here, and I swore I’d never do it when I grew up. And now, sadly, my mom is paying for all the damage she did to her skin. She’s 79, and, while you’d expect some wrinkling, you’d not expect as much. A chemical peel uses a chemical solution to smooth the texture of facial skin by “burning” the outer layers. With outer layer gone, some of the facial blemishes are gone too. But not for long because the reason for their appearance in the first place has not been eliminated. Microdermabrasion is a general term for the application of tiny rough grains to remove the surface layer of skin. The Derma Peel procedure uses controlled vacuum and pressure to move microscopically abrasive crystals over the skin, abrading the skin’s outer layer. The promise of Derma Peel: When you repeat this process several times over several weeks or months, younger softer skin moves to the surface, revealing significant textural and color improvements. The weeks-to-months time frame is understandable—this how long it takes for the new skin cells to develop and move to the surface, naturally. You can find out there some even more sophisticated ways to inflict injury on the skin. Beyond chemicals you can opt for laser treatments, or procedures involving applications of extreme heat or cold. Numerous options are available now, and you can expect ever more ingenious devices to appear in future. All these new skin renewing methods found themselves on an old idea: inducing repair by stripping the other layer of the skin, “tricking” the body into producing new cells and making new collagen. This is performed by estheticians, cosmetologists and makeup artists and is referred to as “controlled skin damage.” It initiates the natural skin repair and renewal of cells. So do you really need a fancy diamond abrasive to activate this natural process? Consider the pattern here: It’s your own body that’s producing new cells. Just by gently stripping off the outer layer by any method, you get that same rejuvenation mechanism going. How the outer layer gets removed really doesn’t matter. One central truth—only your own body can rejuvenate your skin. Collagen is produced by the dermis, the skin’s lowest layer. Your dermis, when slightly stimulated, can restart the production of collagen, which is the cornerstone of healthy skin. Our aim, therefore, should be to create this stimulation by the most natural, least invasive procedure possible. I strongly believe our skin needs daily simulation, but without ever reaching the point of injury, that doesn't fully recover within 5-20 minutes after the procedure. Dry brushing is an ideal home remedy. No expense. No appointment. No inconvenience. A simple, at-home, do-it-yourself procedure you can perform every day whenever you want. There are risks. For example, with phenol there is always the risk that your skin could lose its ability to make pigment. You would then always have to protect it carefully from the sun. Keep in mind, too, that high levels of laser and heat energy can end up damaging your skin more than helping it. Some skin treatments require a mild sedative to relieve pain during treatment. Drugs—any drugs—are never a good thing for your health and beauty. Cost Finally, do understand that all these treatments are temporary. And temporary, moreover, despite often being expensive—cosmetologist office treatments can easily cost $50 to $500 or more, time after time. So you face two kinds of choices…Door number one: Costly treatments that work only for a short time, carrying risk of pain and even permanent damage. 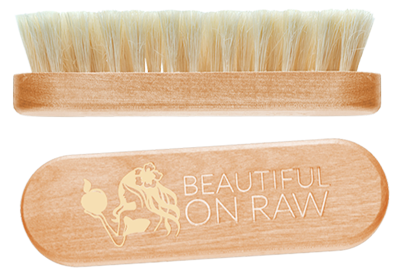 Door number two: An easy, enjoyable natural treatment tool—my dry skin brush. It's a treatment that’s gentle, enjoyable, risk-free, a treatment you control, on your schedule. Best of all—it gives results as good as any cosmetologist can deliver. Regular dry brushing induces the same wound-healing response and increased collagen production. It can lead to a smoother, brighter-looking skin every day, without the fading effects usually unavoidable with ‘in-office’ peel or abrasion procedures. Is there a catch? Sure. Every day—that’s the thing. Daily dry-brushing is gentler than any salon procedure. You’re in control. Scars, pigmentations, stretch marks, general cleanliness and freshness of skin—dry brushing can help it all. But every day is the key!